Who doesn’t love the crunch of a handful of pecans? If this is one of your favorite nuts, you’ll be happy to know that April 14 is recognized as National Pecan Day. This is the perfect day to start snacking or to use the nuts in a favorite recipe or two. Today is a fun national day for foodies. Many of the national and international days of the year have an association with food in some way. Are you confused about what national days are? Find out more in my National Days Guide. 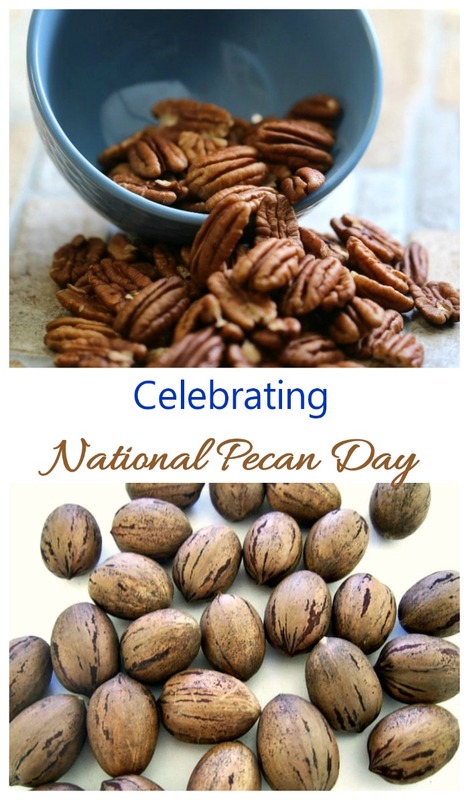 National Pecan Day has been celebrated since 1996. It was first started by the National Pecan Sellers Association. The nut is so popular that the whole month of April is also know as National Pecan Month. Pecans are a healthy nut. The nut has a lot of antioxidants as well as many vitamins and minerals and heart healthy fats. Pecans are low in cholesterol and sodium and high in protein. They are known to have many health benefits. Here are some fun facts about pecans. Over 80% of the pecans used around the world come from the United States. 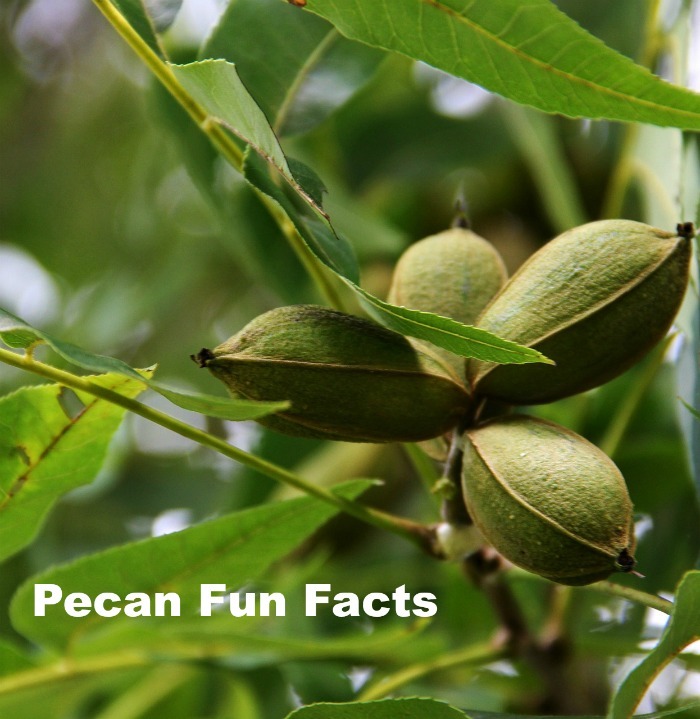 A pecan tree has both male and female flowers on the same tree and these are wind pollinated. The word pecan comes from an Algonquin Native American word that describes nuts which require a stone to crack them open. San Saba Country in Texas has proclaimed itself as the pecan capital of the world. This might be doubtful, since Georgia is the production leader! The average recipe for pecan pie uses almost 80 pecans. A pecan is not actually a nut. It is a drupe, which is a fruit with a single stone or pit that is surrounded by a husk. Pecan trees can live for 200 years but you only get a heavy crop of nuts every other year. The alternate years are lighter. 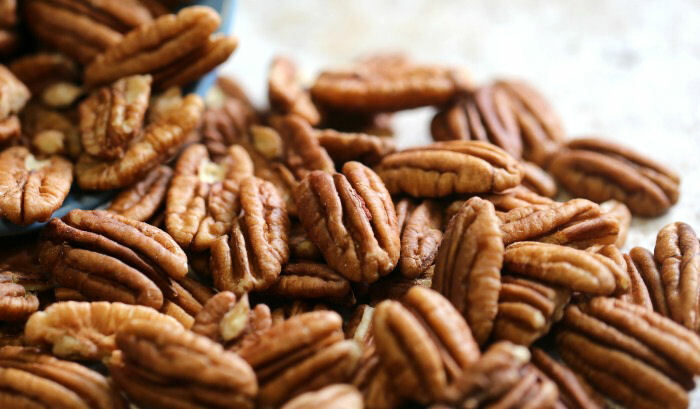 If you are looking for fiber in your diet, eat pecans. A serving gives you about 11% of your daily fiber requirement. Pecans are also one of the most nutritious nuts and are widely used in baked goods. The handles of the torches for the 1996 Olympic Games were made from the wood of Georgian pecan trees. The pecan tree has been the state tree of Texas since 1919. The calories in pecans is 694 for a cup of pecan halves. Use Hashtags. Spread the word on social media with the hashtag ##NationalPecanDay. Plant a Pecan tree. Pecan trees grow to a height of 70-100 feet and are hardy in zones 6–9. You might even be able to sell your pecans one day. Use them as counters in a board game. Get nutty by using pecans along with another type of nut as a counter in a Tic Tac Toe Game. One of the best ways to celebrate pecan day is to use them in recipes. Pecans can be used to make home made granola, to jazz up your stuffing mix, and make fabulous baked goods. Although pecans are thought of for their use in pies and other baked desserts, they are also a popular ingredient in many savory recipes. A handful of raw pecans makes the perfect healthy snack. These recipes show that there are lots of ways to incorporate this heart healthy nut into your diet. Toasted Pecans with Maple and Cinnamon makes a healthy Paleo and gluten free snack. Try this roasted carrot salad with pecans and cranberries for a tasty side dish. This candy corn pecan fudge is perfect for both Halloween or Thanksgiving. Used chopped pecans as a coating for these Paleo frozen banana pops. These cranberry pecan crostinis make the perfect party appetizer. Don’t want to be tempted by a whole pecan pie? Try making these pecan pie cookies instead! This pecan crusted chicken spinach salad is a great way to use the nut. There are closed to 2000 National Days in the year. Don’t miss a single one of them. Come often to see which National Day we are celebrating here at Always The Holidays. Also, be sure to check out the monthly list of days to see what other April National Days are celebrated this month and also print out my April National Days calendar to help you plan recipes and craft projects for the month.